Zulu land is a creatively designed to enjoy way of life for wanderers and creative minds. It is an open roof for all who respect and obey individuality. It is well designed with well equipped Doms and common chilling area next to each other. 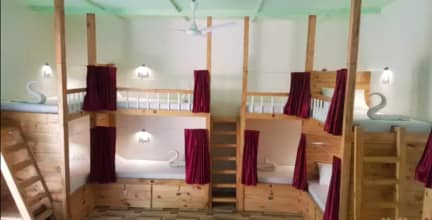 It has a beautiful garden with lots of hammocks and corners with garden furniture to chill and to spend time doing creative things, reading books, Zym area or just meeting and connecting with fellow travelers. Here people cook, play music, paint, walk to the beach or party all night. Individually or together. Zulu land is also famous for Curlies shack and shiva valley, which is famous for its party all night. 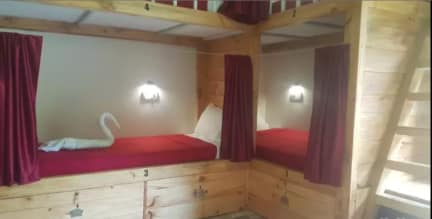 Zulu land has one 16-bed dorms with attached bathrooms & 15 Private premium cottages. Garden area concludes bar/cafe/inhouse restaurant common area, where we serve free breakfast to our guests, drinks and a growing menu of meals and snacks. We stayed in the dorm and it was horrible. It stank of damp and other travellers had left there wet clothes hanging up over bunks and all over the floor. The fan on our side of the room didn’t work and the privacy curtain needs to be higher with no gap. The bathrooms were near on unusable, they looked like they hadn’t been cleaned in months. One toilet was broken and there was never toilet despite members of staff frequently using them. It’s quite out of the way of the main strip. AVOID!!! This is without question the worst hostel I have ever stayed in out of maybe 1000 over the past 7 or 8 years... The staff are thieves, the food will make you sick, and the place is filthy. This sentiment was shared by the few others dumb enough to stay here. I left after a 4 of my 14 days that I pre-booked once I found another place which was not so easy over New Years. An absolute disgrace, this place should be delisted and burnt to the ground.